This Instant Pot Thai Red Curry with Chicken is just delightful! It makes a perfect meal when paired with Jasmine Rice, and it comes together so quickly in the Instant Pot. 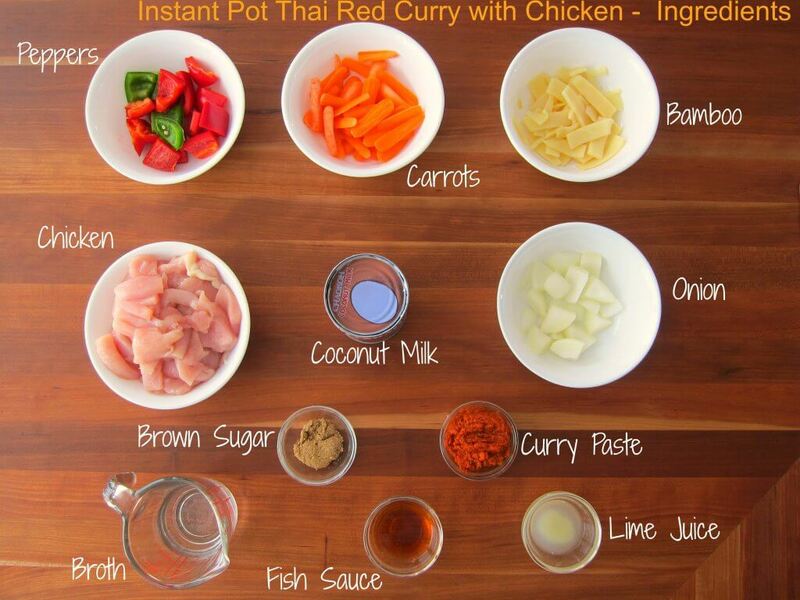 To make it a real one-pot meal, cook rice and Thai red curry together using the Pot in Pot method! Perfect for a busy weeknight meal. Thai cuisine is one of my all-time favorite cuisines. For the longest time, we just went to restaurants to get our Thai fix. And if I ever did attempt to make Thai food, the flavor was not even close to what my favorite restaurants served, and so I just didn’t bother. Finally, I found out that the secret to making great tasting Thai curries is to use the right kind of curry paste. The kind I had been using is the one commonly found in most American grocery stores. Changing brands made a BIG difference to the taste of the curries. There are two brands of Thai curry pastes that I really like: Maesri (which I like best) and Mae Ploy. To take this Instant Pot Thai Red Curry to the next level, do try and find either of these curry pastes at an Asian grocery store near where you live and if you can’t, of course, there’s always amazon.com. Please note that Mae Ploy is a bit spicier than Maesri. There are two more ingredients you should try and get when you visit your Asian grocery store: Lime leaves (also known as k-lime, makrut and sometimes kaffir lime) and Thai basil. 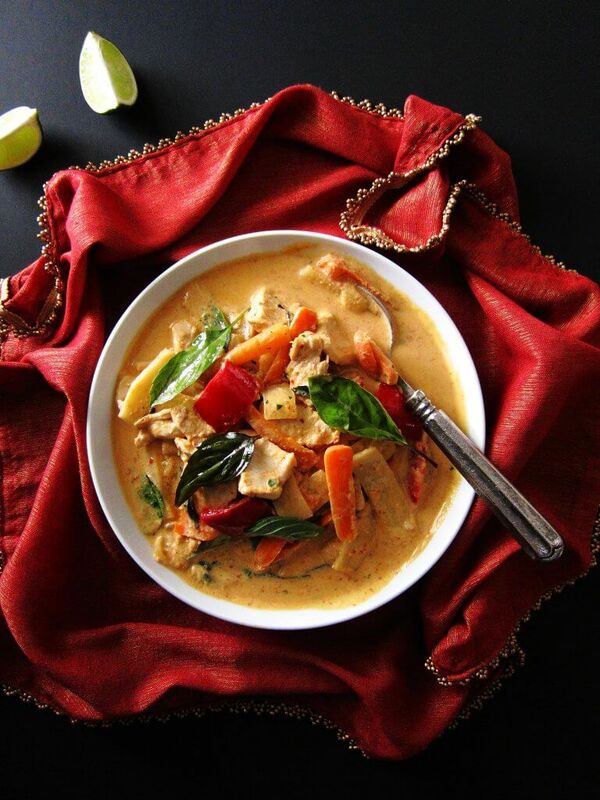 They add unsurpassed and unique flavors to this Instant Pot Thai Red Curry. One other thing I discovered about Thai food is that Thai curries taste best with Jasmine rice. There’s something about Jasmine rice that soaks up the curry and just enhances the flavors. Regular white rice, basmati rice, and brown rice just don’t taste the same. Here’s my recipe for Instant Pot Jasmine Rice. For the coconut milk in this Instant Pot Thai Red Curry, I use the regular fat content, and don’t opt for the light variety – again, there’s a taste difference. This recipe is the Instant Pot version of my Thai Red Curry. Thai food purists would say that Thai food shouldn’t be pressure cooked. I’m guessing you’re here because you just want to make a Thai curry in your Instant Pot and don’t care about rules! And pssst, guess what?! This curry is just wonderful cooked in the Instant Pot. I’m not kidding – it’s really tasty. It comes together so quickly, and it’s my go-to dish on really busy days. I always keep coconut milk and curry paste in my pantry and I use whatever meat and veggies I have on hand. I hope you give it a try. 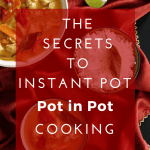 Oh, and to make life really easy, check out my easy-to-understand, step-by-step article on Pot-in-Pot cooking – it shows you how to make this curry and rice together. At the same time! 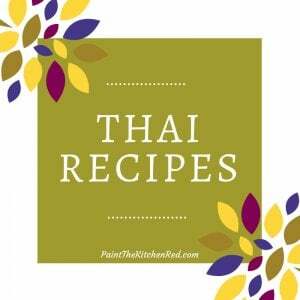 Click below to see all my Thai recipes! If you’re new to the Instant Pot and aren’t familiar with how to use it, please read the Instant Pot DUO Beginner’s Quick Start Guide or the Instant Pot ULTRA Beginner’s Quick Start Guide first and then come back here to learn how to make Instant Pot Thai Red Curry with Chicken. Stir in chicken, remaining coconut milk, and chicken broth. * Note: if your chicken pieces are bigger, then you’ll need to add on a few minutes of cooking time. The display will count down from 4 to 0; it will then switch to ‘Keep Warm’ mode and display ‘L0:00’. To open the Instant Pot, first move the steam release handle to ‘Venting’. I like to place a folded towel over the steam release handle and move it to the venting position. Remove the towel after turning the handle. Stir in fish sauce, brown sugar, lime juice, bell pepper, carrot, onion, bamboo shoots, and lime leaves. Cook until vegetables are crisp-tender, about 3 to 5 minutes. Don’t overcook, as the vegetables will continue to cook in residual heat. Taste and adjust with more fish sauce, brown sugar or lime juice. Stir in the Thai basil leaves. Serve with Instant Pot Jasmine Rice. This Instant Pot Thai Red Curry with Chicken is delightful (and addicting!) It makes a perfect meal when paired with Jasmine Rice, and comes together so quickly in the Instant Pot. Perfect for a busy weeknight meal. Select ‘Saute’ and stir in red curry paste and 1/2 can of coconut milk until mixture is bubbly, about a minute or two. Close Instant Pot and make sure steam release handle is in the ‘Sealing’ position. Stir in fish sauce, brown sugar, lime juice, bell pepper, carrots, onions, bamboo shoots, and lime leaves. splatter screen, if necessary, to guard against the coconut milk bubbling up. You can choose to substitute the vegetables with your choice e.g. green beans, zucchini, sweet potatoes, and you can also increase the quantity of vegetables. My chicken was thinly sliced. If your pieces of chicken are larger, you'll need to add on a few more minutes of cooking or just do a natural release of pressure. Great photos! Such a beautiful, colorful dish. Any way to make this without meat? Tisha, you could use tofu and pressure cook for about 2 minutes. If you make it with just vegetables, you might want to skip the pressure cooking and just cook the veggies in ‘Saute’ mode. Will this work with frozen chicken? Have you tried pot in pot rice, cooking both at the same time? Although I haven’t tried it, I think it would work. You may have more liquid at the end, which you can reduce by using the Saute function and you might have to increase cooking time, depending on size of the chicken pieces – if it’s small pieces like the recipe, maybe just a couple of extra minutes. Let me know if you try it out. And funny you should mention pot in pot. I’m getting ready to do it that way as we speak. I’ll reply to this comment when I finish! Hi Kit – pot in pot worked out great but I would suggest using chicken thighs because breasts turn out a bit dry. I plan to do a post very soon on pot in pot, with multiple dishes. The first picture of the curry is really good Neena!. You are absolutely right on the money – Maesri, kaffir lime leaf, thai basil and full fat coconut milk make all the difference. Thanks, Romain. I sometimes add chiffonade-cut kaffir lime leaves. It adds a strong kaffir flavor, which I love! Delicious, Neena!! Thumbs up all around in our house tonight after serving a Whole 30 version of the Red Thai Curry…served with cauliflower “rice”. Sounds a bit scary to those unfamiliar with Whole 30, but the flavors were wonderful. I love cauliflower but haven’t got around to trying the cauliflower rice trend. I might have to try it out! Thanks for the feedback, Jan! Did you make this without the brown sugar? Sub anything, or just omitted? DELICIOUS! Another fantastic meal. I made this in my 8 quart Instant Pot- worked perfectly. I didn’t have time to get the kaffir lime leaves and it was still amazing. Many thanks from the family. As you said easy for busy workday and delicious entertaining. Thanks Joyce, that’s a great tip! Excellent Recipe thank you! Your Curry Chicken is amazing, too! Thanks Barb! Your comment means the world to me! We do not have East Asian groceries here, are there any worthy substitutes for the basil and the Kaffir lime leaves? I have tried some of your other recipes and I love love love them!! Hi Lisa – Since you can’t get those ingredients, you can substitute lime zest for the lime leaves. I would put it in at the end and adjust the quantity per your taste. If you are ever near an Asian store, you can buy the kaffir lime leaves and stick them in your freezer when you get home. For the Thai Basil, regular basil won’t be the same but I think it will be fine. Good luck! Made both your Thai Red curry with chicken and jasmine rice. Turned out perfect and very tasty for 3 adults and had left overs. Used 1.5 pound of boneless skinless thighs. Substituted lime rind and lemon rind and regular basil. Added some extra chili paste for spiciness.Thank you again. You’re so welcome. Thanks for mentioning your substitutions. I’m glad you liked the recipe. Any substitutes for the fish sauce or can we omit? Have you tried with any other vegetables- hubby is not a fan of bell peppers. Thanks. Hi Sara! There is really no substitute for fish sauce. I’m not sure if you’re concerned about ‘fishy’ taste, but once cooked there is really no fish taste. I would omit and just add some salt since fish sauce provides saltiness. You could try soy sauce but it’s not the same at all. Regarding the vegetables, you could try thawed frozen peas, zucchini, or green beans. I’ve used them before and they all taste great. I usually substitute oyster sauce for fish sauce since my husband has a fish allergy and it turns out great. Hi Kavita – my husband is from Goa too! There’s nothing like fresh coconut milk right? I use two brands: Aroy-D and Chaokoh. Both are Thai brands I believe. I hope you get to try some recipes – thanks for visiting the site! Great Kavita! I love that brand and Chaokoh works well too. 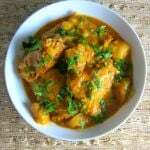 My Instant Pot arrived Wednesday, I made this chicken curry for dinner last night. Absolutely delicious! It was a little too spicy for my husband, but I’ll cut back the curry paste a bit next time I make it. Your directions were so easy to follow, so it turned out perfect even for an Instant Pot newbie! I am looking forward to trying other recipes, and truly appreciate your excellent “How To” section (since the instruction manual that came with the Instant Pot is not terribly helpful). Thank you! You’re adventurous to make chicken curry in your new Instant Pot – I made rice, eggs, other boring stuff! Thank you for your kind comment, it really means a lot to me. I’ll be posting Beef Massaman curry next week so watch out for it. If you sign up for the newsletter at the top of the page, you’ll get an email when I post it. Have a great day! I’m glad you agree about the curry paste making all the difference. I think 2 tablespoons would work just fine too. This is such an easy curry to make that I often make it when I’m really strapped for time. Made your curry tonight and the flavor was fantastic! My sauce seemed a little curdled, however. Any suggestions for how to prevent this? Thanks! Hi Debbie – I’m happy you liked it! When I make it, sometimes the coconut appears to separate right after cooking, but once I stir it and cool it down a bit it looks creamy again. It could be the brand of coconut milk. If your coconut milk ingredients include fillers, you might be getting different results. Have you tried Aroy-D or Chaokoh brands? Thank you for your reply. I used Trader Joe’s organic coconut milk. I will look for the brands you suggested. I am still new to the instant pot. What adjustments to cooking would i need in order to double the recipie? Hi Aisla, I think you should be fine just doubling the quantities and keeping the cooking time the same. This is not always the case with IP recipes. Some recipes, doubled, can overfill the pot and not come to pressure. This one, because of the chicken being cut into bite size pieces, should be just fine. Let me know how it turns out! Great recipe! My first try at Thai curry. I do have a stupid question… do I take out the K-leaves after cooking or leave them in? I was not able to find them but will be ordering some. Thanks! Not a stupid question at all. The leaves are totally edible but the way the recipe is written, where they’re kept whole, you would just remove them while you’re eating. However, I often cut the leaves into tiny pieces, and so they are just eaten with the curry. The lime flavor is a bit stronger then too. If you’re getting fresh kaffir lime leaves, buy extra and freeze them. That’s what I do. Is it possible to use tofu instead of chicken? Hi Priya – yes, you can substitute tofu. I would make sure it’s pressed and drained well. And cook for about 3 minutes. This is awesome! We loved it! Thank you for letting us know, Natalie. I’m so glad. If i want to turn this into vegetarian dish adding tofu instead of chicken, what I can substitute fish sauce with? Thanks. You can use well-drained and pressed tofu and cook for about 3 minutes. Fish sauce doesn’t have a good sub – I would omit and add more salt. Or you can try and use a bit of soy sauce – not the same but will be okay. We made this for dinner last night and it turned out super delicious! Love how easy it was to follow along to your instructions! Hi Marie – I’m so glad you liked it; one of my favorites. I think you’ll like the other Thai curries too! Thanks for your comment. This was phenomenal. I wanted to add butternut squash to the curry, so I added it with the chicken and cooked them together for 7 minutes. Then added the rest of the veggies on saute and it was divine. Thank you for a delicious recipe! Hey Sarah – thank you so much for your lovely comment; you made my evening! What a great idea to add some seasonal veggies to the curry. The color must have been beautiful. The squash must have added a hint of sweetness – nice! Thank you for the recipe; it’s really good (and easy, too)! I used chicken thighs (it’s what I had on hand) and since I try to limit fat in our diet, I used half a can of full-fat coconut milk, and made up the difference with fat-free evaporated milk. I thickened the sauce with just a bit of cornstarch. Those modifications may sound like sacrilege, but it was still very tasty. You know what, Diane? I’m all about the taste, so however you modify it, if it tastes good to YOU, then that’s all that matters 🙂 Yes, I too have had to resort to cornstarch in the unlikeliest of dishes, when I cook in the Instant Pot! So glad you liked it and thanks for sharing your substitutions. How much cooking time would we need to add if we only have bone-in chicken on hand? Hi April, thanks for your question. I’ve cooked bone-in chicken anywhere from 8 to 15 minutes depending on the size, with natural release. 15 minutes will make it fall-off-the-bone. Hope you like it! This was ahhhhhmazing. I tripled the recipe thank goodness! I omitted the peppers and instead added shiitakes and snap peas. Also added a little Sambal Olek and sweet thai chili sauce just cuz. Can’t wait for leftovers tomorrow. Trycia – so glad you enjoyed it and I love it when people make a recipe their own 🙂 You’ll love the green and massaman curries too. Thanks for commenting. learn functions on my Instant Pot as well. It was less intimidating than I originally thought. Thanks for commenting, Sarah Jane! I’m happy that you enjoyed it – a great first recipe for the Instant Pot, now that I think about it! Enjoy your new IP. Hi, if I was to use frozen chicken breast (skinless, boneless)…how much time do I use to pressure cook? looking to make it tonight. thanks. this sounds so delish. Elle – if the chicken is frozen but cut into the same size as suggested in the recipe, you can cook for the same amount of time. This is because the Instant Pot will compensate for the temperature by just taking longer to come to pressure. Also do keep in mind that frozen chicken might make your curry more liquidy, so you might be able to reduce the quantity of broth. Enjoy! Never made curry before and tried this on my second use of my IP. Stellar! Now I have a vegetarian in the family so will try with tofu, but wondering if seitan would work? I’ve never cooked with it before, so totally clueless. Kristen, glad you liked it! I’ve not used seitan in my Instant Pot before, but tofu works great – about 2 to 3 minutes should do the trick. I bought a 3 qt instant pot, just to make this rexipe, and I was not disappointed. 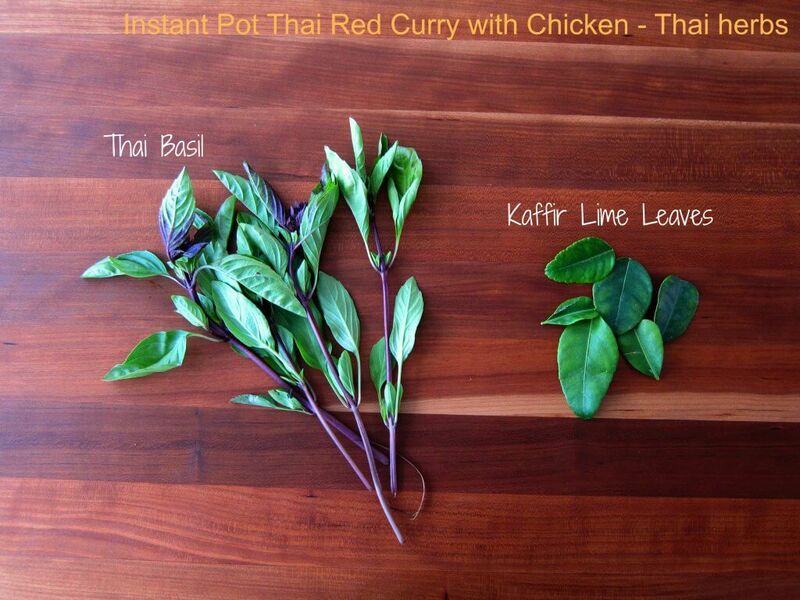 I got the red curry and Thai basil off of Amazon, and used dried kaffir leaves I had previously ordered. This was SO GOOD! I did add some extra chicken broth due to the heat ( I have a 12 yr old in the house who is just learning to appreciate spicy food, but only able to tolerate it in small amounts). This will definitely become a regular on our menu! Thank you for sharing. More instant pot recipes, please! Hi Deborah – wow, that’s great to hear – thank you so much for sharing! I started my blog doing all kinds of recipes but over the past year it’s all Instant Pot 🙂 I think you’ll really like the Massaman curry. It’s delicious but really mild. I just made by request for my daughter’s birthday! tried this recipe before and i loved it! amazing flavours! will the cooking time be the same? 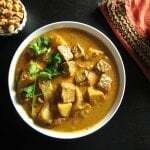 Natalie – I’m glad you enjoyed it; one of my favorites 🙂 For beef, look at the Beef Massaman curry recipe and follow the time on that. Easy and fantastic! I definitely want to make it hotter next time so will buy the hotter curry paste. Thanks for this recipe; the while family loved it, including my 10-year-old! Thanks Susan! You need to try the green curry if you like spicy! For this (red curry) recipe, you could increase the quantity of curry paste to get it more spicy also. How big is the pot you used for the Curry? Hi Sheila, thanks for your question. All my recipes are tested with a 6 quart, but will work as written for the 8 quart. However, with a 3 quart you might need to reduce the quantity based on fit, but cooking time should be approximately the same. Hi can I double this recipe will it fit in a 6-quart instant pot? Tommy, yes you can. Just make sure you don’t go over the 2/3 full mark. Flavor was delicious and the instructions where easy to follow, but this is more like a soup, I prefer my stovetop curries, which have the same ingredients, but have a thicker consistency. Hi Carmen, thank you for your comment. I love having gravy to soak into the rice! If you wanted to have a thicker curry, you might be able to omit the broth. Love the basic recipe. Tweaked it a bit. I did’t have Kaffir leaves or Thai basil. Used lemon and lime zest. Used regular basil. Added about 1 tbls of lime juice and 1 1/2 tbls of lemon juice. Added 1 tbls of chinese samba oelek to it for heat as well as a sliced jalapeño unseeded. DELICIOUS! Right amount of heat but not too much. Hi Deb – Sounds like you like spice-ay! I think you’ll really like the Instant Pot Green Curry too. Thanks for sharing your modifications. I couldn’t find fresh Thai basil but I did find dried. How much would you recommend to use? Kendra, the general guideline I go by when subbing dried for fresh herbs is 1/3 the quantity. I would say maybe 2 tsp. I’m not sure how much flavor the dried Thai Basil has. You can even use regular fresh basil. WAY too much fish sauce. Maybe brands vary. Also, I used green curry paste. I love spice but it was too spicy with the 3 tbs. I think with adjustments it would be good. I have coconut milk with the cream on top. Was I suppose to mix the cream into the liquid at the bottom of the can? I left out most of the fat but it ended up being a little runny. Hilary – I have a green curry recipe also on the site. Green curry paste is generally much more spicy than red curry. At restaurants, I order mild and find it spicy enough! Massaman is the mildest. re: fish sauce, yes maybe it was the brand. And yes, when I make it I just stir up the can and use it all up. You can also saute on low with just the thick cream part, and add the remaining quantity before pressure cooking. Hope you get to try it out again. Made this tonight, and it was delicious! Thank you for posting. Thanks for your comment, Jasleen! I’m really happy you enjoyed it. I would like to use a yam instead of the carrots for this recipe. Do you suggest some extra time for this? Hi Linda – you might be able to cook the yams with the chicken, with a quick release (QR). I would try that and then add any remaining veggies when you open the IP. Let me know how it works out. This recipe is easy and extremely delicious. Normally, we get our Thai curry dishes at a restaurant. Those days are over, because the homemade curry is yummy! I purchased the recommended Maesri red curry and Aroy-D coconut milk at an Asian grocery store and was surprised at how inexpensive they were. The curry and coconut milk made a huge difference in flavor/texture. I couldn’t find the lime leaves, but I’m ordering some on Amazon for next time. Thank you so much for this wonderful recipe! Hi Nancy – I feel exactly the same way! Just made a Panang curry last night, still trying to perfect it and hope to get it out soon 🙂 re: lime leaves – I’ve mentioned this on other comments, but if you’re ever in another town or city that has a big Asian store, buy some and they keep in the freezer really well. Lime zest works as a great alternative – just add a little bit to taste after cooking. Three tablespoons of red curry paste sounds like this will be pretty hot! How many stars of heat would you give it on a scale of 1 to 5? Hi Jeff – I guess it would depend on your tolerance, but eating it with Jasmine rice, the Maesri brand is a 2.5 to 3 for me. The Mae Ploy brand is spicier. If you choose to make it as written, just get some extra coconut milk and dilute at the end, to suit your tastes. The green curry, on the other hand, is more like a 3.5 to 4. And the Massaman is 1.5 to 2 🙂 Thanks for your question, and hope you like the recipe! Thank you! Have you used Thai Kitchen brand? It’s the only kind our local store carries. I wonder how it rates on the spiciness scale? I used to use Thai Kitchen before I discovered Maesri. It’s fine, but will not give you the best taste you can get. I feel it’s milder. Wow, great recipe. 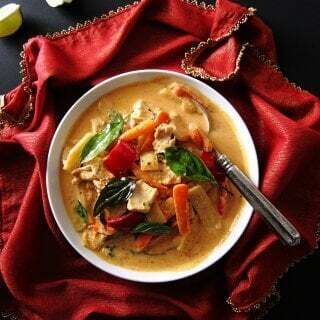 I’ve loved Red Curry since my first taste and the coconut milk enveloped my senses and changed my world. I’m still missing the rich, lingering Coconut flavor I desire, any suggestions? I’m using the Mae Ploy paste and Aroy-D coconut milk. My second batch I dropped the 1/4 cup broth and used Aroy-D coconut milk which made a huge difference, but, the rich reddish soup still isn’t up to the standard I taste a my Thai Restaurant. Any suggestions would be greatly appreciated. Hi Nick – you’re on the right track getting the right ingredients. Regarding the 1/4 cup broth, it’s mainly added in case people have trouble with the IP coming to pressure – now that you know you have no problem with that, you can easily leave it out. You could try and make your own paste, but it is time consuming and requires quite a few specialty ingredients. You could also try out Maesri the next time you need to buy the paste – I actually prefer it. Here are a couple of other things you could do: a) try and add some coconut oil when frying your coconut milk b) when frying the paste, do it with just the cream – so don’t shake up your can but use the thick cream at the top first c) make sure your coconut and curry paste cook really well, till it’s bubbly and even looks separated (watch out for burning!). Then add the thinner coconut milk and proceed with the recipe. d) Finally, add a tiny bit more of any of the ingredients to your taste (except the curry paste) after cooking. I hope that helps you out and thank you for commenting! Made this tonight and it was very good. I used chicken thighs, regular basil and used lime zest in place of the lime leaves which I couldn’t find. Will definitely keep in my regular dinner rotation! Thanks, Karen, for your lovely comment! I just made it for dinner. It is so delicious. Hats off to you for the detail instructions??. I am not a cook but by following your instructions meticulously I made an amazing Thai meal. I love the pics. Thank you so much. You’re so welcome, Sajida! Thanks for your comment. This was wonderful! Thank you for the recipe as well as the tutorial, this was the first recipe I’ve tried with the Instant Pot. The flavor was perfect and I took your advice and purchased the curry paste, coconut milk, basil and lime leaves from a specialty Asian grocer. Again, thank you for helping me have a successful first try! Hi Christine – glad you liked it, especially since it was your first Instant Pot recipe! Thank you, thank you, thank you, this was AMAZING! I recently became hooked on Thai Red Curry from a local Thai place and was really jonesing to make it at home. I took your suggestion and got the curry sauce from the Asian market and it was PERFECT!!! My local place uses ground chicken breast, which would be lovely in the IP. I’m planning on trying your other curries as well! I’m also a BIG fan of Jasmine rice in the IP, which went perfect with this too, obviously lol Thanks again, you’ve got a new fan! Hi Susan – wow, what a nice comment. I’m really glad you were able to make a restaurant favorite at home! If you like spicy, the green curry is quite tasty too – different flavors but really good. This recipe looks delicious, I can’t wait to try! One question from a new IP user; do you know if this would work cooking the rice as well in the IP using the stackable pots? Hi Lea – perfect question. Short answer is yes, but take a look at this Pot in Pot Cooking article I wrote. It addresses your exact question. Hey there Stacey – thank you for your comment, I’m so glad you liked it. You’re the second person who’s mentioned cauli rice with Thai food this week – I’m going to try it soon! This was the first recipe I tried several months ago when I purchased an Instant Pot. Wow! My family loved it! Since then I have made it several times, always with rave reviews. Happily, I am able to purchase the Maesri Curry Paste from a local Asian supermarket, along with the lime leaves and Thai basil — they are irreplaceable in my opinion. I double the recipe ingredients, keeping the pressure cooking time the same but allowing a little longer sautéing time due to the doubled vegetables. My “newbie jitters” when first using the Instant Pot have dissipated because of your excellent step-by-step instructions and photos. Thank you so much, Neena! Hi Jane, Thank you so much for sharing! I’m so glad you agree that the ingredients make all the difference! You’ve now graduated from newbie – congrats! I agree! thank you SO much for posting the step by step instructions for the instapot! made it a breeze for a newbee!! Thank you, Sarah. I’m always happy to help.